On 30th November the Government and HS2 Limited confirmed the route of Phase 2 from Fradley in Leicestershire to Crewe in Cheshire and issued safeguarding directions for what is referred to as Phase 2a. This step follows the Chancellor’s announcement last week that the route from the West Midlands to Crewe will be opened six years earlier than planned in 2027. In July 2013 HS2 Limited issued plans for the prospective route to Crewe and following a period of consultation, has now confirmed that subject to a number of refinements, the route as previously published is the preferred choice. Accordingly, safeguarding directions have now been issued along with the launching of consultation on long term property compensation and assistance packages for those affected along Phase 2a. The consultation on the proposed package of schemes for Phase 2a will run until 25 February 2016. “The issuing of safeguarding directions now gives more certainty to those affected along the route. This is most welcome, particularly after years of waiting”. Issuing safeguarding directions means that owner-occupiers in the safeguarded area (usually 60 metres either side of the line of route) can serve a blight notice, asking the government to purchase their property. As part of their compensation package a claimant will receive the un-blighted Market Value of their home, together with reasonable disturbance compensation and a Home Loss Payment, equivalent to 10% of the Market Value, which was increased to a maximum sum of £53,000 in October 2015. 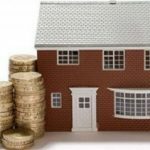 This scheme relaxes some of the criteria that qualifying applicants have to meet in order to have their property bought by the government under a blight notice. 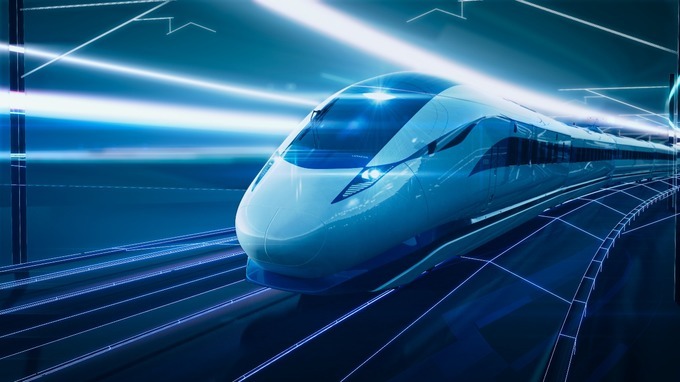 The government has launched this particular part of the proposed package on an interim basis to make sure the people most directly affected by HS2 can access assistance with minimal delay and hindrance. Its long term application to the Phase 2a route will be decided as part of the outcome of the consultation on the long-term discretionary schemes. Owner-occupiers of homes and small businesses between approximately 60 metres and up to 120 metres from the line in rural areas would be able to submit an application to HS2 Ltd to purchase their property at the full, un-blighted Market Value under the voluntary purchase scheme, thus disregarding the impact HS2 will have on the property market. 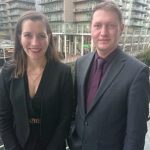 As an alternative to the voluntary purchase scheme, these eligible owner-occupiers would also have the option to accept a cash offer of 10% of the full un-blighted Market Value and stay in their homes and businesses. This will support people who want to remain in their community. Those beyond the 120 metre boundary but within 300 metres of the line in rural areas would, following Royal Assent of the Phase 2a HS2 hybrid Bill, be able to apply for a homeowner payment ranging from £7,500 to £22,500, which will enable them to share early in the benefits of the railway. 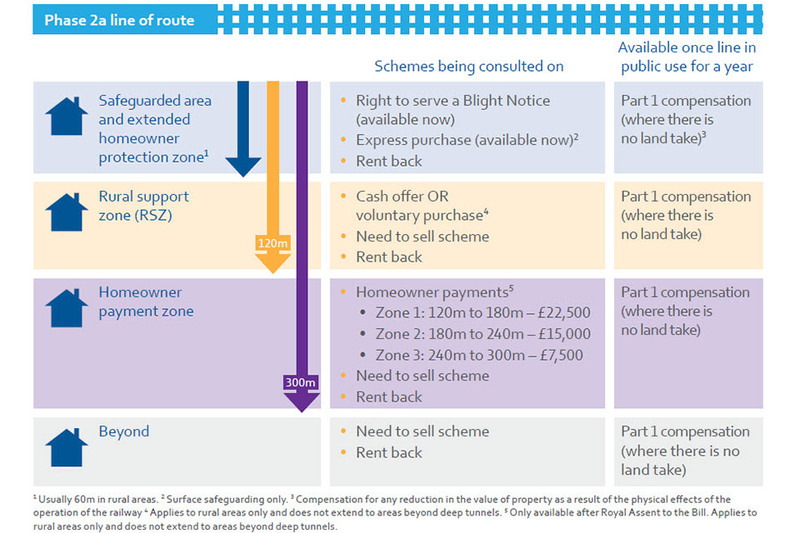 Eligible owner-occupiers living any distance from the line of route would be able to apply to the need to sell (NTS) scheme, which would also pay the un-blighted Market Value to people with a compelling reason to sell their property, but who have been unable to do so – other than at a substantially reduced price – due to HS2. 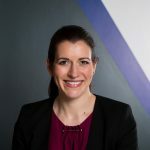 The exceptional hardship scheme will remain in place on the Phase 2a route until a final decision has been made on the proposed package of compensation and assistance. It will also remain in place on the wider Phase 2 route until a long term compensation and assistance package is in place there, which we would expect to follow a route decision and consultation, as on Phase 2a. This scheme is designed to help owner-occupiers who, for reasons of exceptional hardship, have an urgent need to sell their property, but have not been able to do so, except at a substantially reduced price, as a direct result of HS2. Successful applicants will be paid the full un-blighted Market Value of their property. In addition to confirmation of the West Coast Mainline Hub at Crewe, it has been confirmed that a similar Hub serving the East Midlands and on to Sheffield and Leeds will be developed at Toton. Elsewhere in Sheffield a HS2 Station will be created to Meadow Hall. The delivery of Phase 2a will be subject to its own hybrid Bill, which the Government will be seeking to deposit in Parliament in 2017. 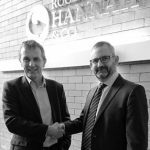 Should you be affected by High Speed 2, whether you are a home owner, investor or occupy commercial premises, we have a dedicated team at Roger Hannah who can provide advice and assist you.